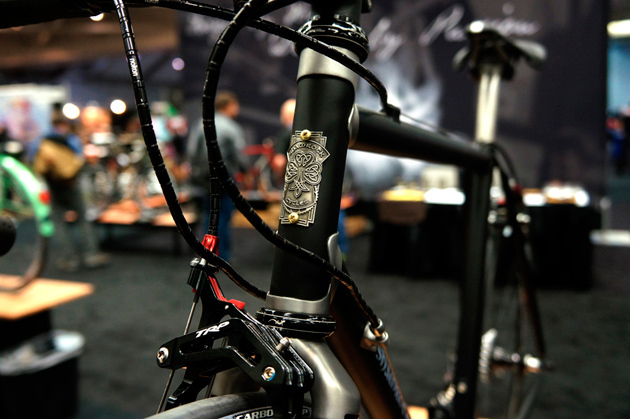 A personal favorite of ours at the North American Handmade Bike Show in Sacramento last year, this week’s Ferrous Friday selection is the handiwork of Tim O’Donnell, builder and frontman over at Shamrock Cycles, hailing from none other than the “mountains” of Indiana. “So this bike is for a repeat customer. He bought a road bike and a cross bike from me over the years and was in the market or something else. On the previous bikes we always discussed the final finish in terms of that "classic" look. This time he wanted to try something a little different. Still the traditional bike with lugs, steel fork and stem, etc. But also with a little bit of a contemporary feel to it. The sloping top tube and straight bladed fork legs fit this requirement perfectly in my opinion. But instead of a fast back attachment of the seat stays like on more modern bikes, I thought it would be cool to keep the stays in a side-tack arrangement. The tubes are the PegoRichie Spirit for Lugs pipes. They are just about all I work with anymore. Plenty light without me worrying about tubes buckling in a relatively minor collision. Plus they are straight. Damn straight. I get really tired of rolling crooked tubes across my surface plate.